In a reasonable attempt to better the lives of my daughter, Cara, and son-in-law, Jim, as well as enjoy their company during a concentrated effort, I assisted them in landscaping one fine weekend day. With the primary goal of building a retaining wall and secondary goal of tidying up overgrown greenery, I attacked a palm tree grouping with pruning shears. 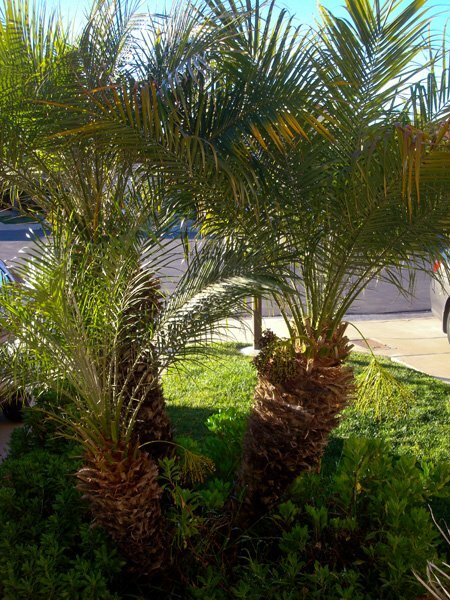 The palm tree group of three (Phoenix roebelenii to be scientifically precise) hadn't been pruned since they moved in some two years ago. It was well overgrown and in serious need of shaping. 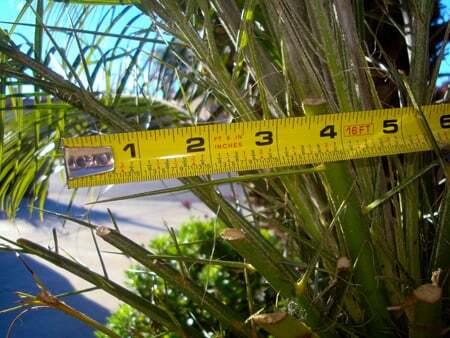 This is the actual grouping of three Phoenix roebelenii palms that had the thorn causing plant thorn arthritis. Jim was industriously off at the store purchasing cement blocks, and I was in a hurry to get the pruning completed so as not to slow the construction of a block retaining wall upon his return. I was wearing gloves that had extra padding over the knuckles. I finished the pruning in a timely manner and was available to help Jim unload the blocks when they arrived. We installed the blocks regularly along a well-designed foundation that Jim and his boyhood friend Andrew built. While lifting the blocks, I felt a soreness in my right hand and at first wondered if I had strained the tendons of my fingers by pruning too rapidly. I removed the work glove on my right hand to find two thorn tips embedded in it! One was in the back of first segment (proximal phalanx) of my middle finger. The other was stuck directly in the joint at the base of the middle finger, the knuckle joint (third metacarpophalangeal joint). A thorn on this Phoenix roebelenii measures 3 ½ inches in length. I gently removed the two thorns and was hopeful that all would be well. Understand that having a thorn in tissue like the finger is usually not a serious problem. Also understand that having any remnants of thorn within a joint is a very serious problem. Over the next day, the finger was fine, but the knuckle joint became slightly reddened. It did not hurt. The redness resolved within 48 hours and I attributed it to either blood inflammation from the trauma of the thorn, inflammation from the resin on the thorn, or both. When all cultures returned "no growth," because of persisting swelling and stiffness of the joint, I suspected that I had tiny thorn remnants within the joint. This is in spite of the fact that radiology imaging studies did not detect a thorn fragment. Also, the swelling of the joint did not have the appearance of what I was familiar with in cases of bacterial infection. With bacterial arthritis of a joint (septic arthritis), the joint is very hot, very red, and very painful. There is often accompanying inflammation of the adjacent skin tissues. My joint, however, was not perceptibly warm and was stiff but not really painful. These features as well as the delay period of nearly a week from the initial thorn puncture until developing the arthritis are classic features of plant thorn arthritis. I must at this point explain that I am an arthritis expert (a rheumatologist) and, while I had known about plant thorn arthritis, I had never seen a case. The development of the inflammation in the joint of plant thorn arthritis is a slow process that involves certain immune cells that gradually accumulate in the joint lining tissue (synovium). This immune response to the foreign material (thorn matter) within the joint is referred to as a foreign body granulomatous reaction. It is not as acutely inflamed with warmth and redness as is a bacterial infection, but it is just as dangerous and destructive to the joint, although slower. There is only one treatment for this form of arthritis -- surgically removing the inflamed tissue and all plant matter within the joint. So, resigned to the facts of my miserable reality, I consulted with a true expert hand surgeon, Neil Jones, MD, professor of orthopedic surgery and director of the UC Irvine Hand Center at the University of California, Irvine Medical Center. We arranged a surgery date a week later and, after regional anesthesia "deadened" my right arm and with light general anesthesia, he opened my knuckle and removed the angry, inflamed tissue as well as a 1 millimeter thorn fragment! That tiny little beast was inflaming my joint and causing my misery. 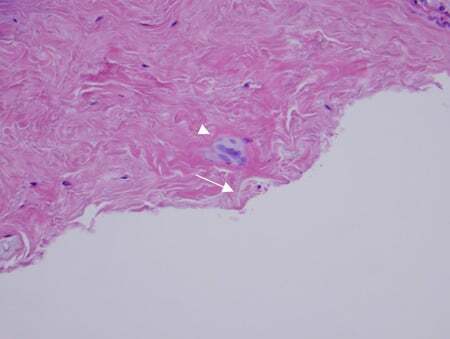 Pathology photo showing multinucleated giant cell granulomatous reaction (triangle point), synovial hyperplasia, fibrosis, and adjacent foreign vegetable matter (arrow with thorn fragments) with hematoxylin and eosin stain (H&E stain). Kindly provided by Xiaohui (Sheila) Zhao, MD, PhD, of the Department of Pathology and Laboratory Medicine, University of California, Irvine Medical Center. 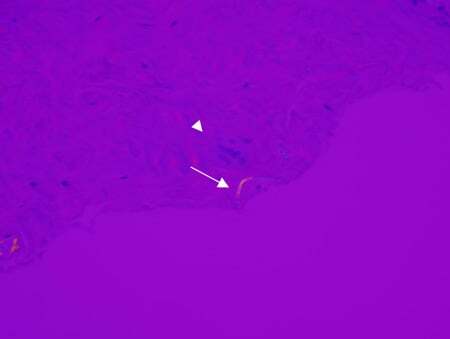 Pathology photo showing thorn material (blue and yellow birefringent material) visualized under polarized light microscopy. Kindly provided by Xiaohui (Sheila) Zhao, MD, PhD, of Department of Pathology and Laboratory Medicine, University of California, Irvine Medical Center. 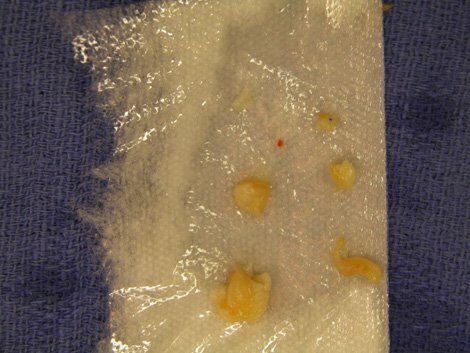 With permission, these are intraoperative photos of the author's right third metacarpophalangeal joint exposing inflamed joint lining tissue (synovium) from which a 1 mm thorn tip from the common palm tree Phoenix roebelenii was surgically resected. Kindly provided by Gabriel Trainer, MD, and Neil Jones, MD, orthopedic hand surgery, University of California, Irvine Medical Center. With permission, photos of joint lining tissue (yellowish synovium) resected from author's right third metacarpophalangeal joint after thorn puncture with 1 mm thorn tip (dark dot on thorn covered with joint lining tissue) from the common palm tree Phoenix roebelenii. 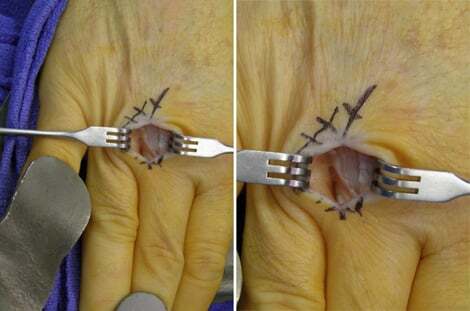 Surgical resection of the inflamed tissue (synovitis), as well as all thorn fragments, is the key to curing plant thorn arthritis (plant thorn synovitis). Kindly provided by Gabriel Trainer, MD, and Neil Jones, MD, orthopedic hand surgery, University of California, Irvine Medical Center. I had to keep my hand dry and elevated for the next five days. Then it was up to me to aggressively work the joint by moving it as much as possible to regain the range of motion and power. The stitches came out in 13 days. While I am still in the midst of rehabilitating my hand, I anticipate a complete recovery. I recommend great caution when working around thorny plants. In spite of the fact that I had work gloves on, the palm thorn was sharp enough to easily pierce the glove material and puncture my hand without me actually noticing that I had been stabbed! I must express my sincere gratitude for the wonderful professional care that I received from my rheumatologists, Catherine Driver, MD, Al Wehrle, MD, and Hernan Castro-Rueda, MD, from my internist, Don Pratt, MD, from my surgeons, Neil Jones, MD, and Gabriel Trainer, MD, and from my hospitals University of California, Irvine Medical Center and Mission Hospital in Mission Viejo, California.